Numerous neuromuscular and non-neuromuscular diseases are amenable to gene therapy. Rigorously designed and carefully conducted preclinical studies are essential to translate these muscle gene therapies to human patients. Many general guidelines have been published in recent years on how to enhance reproducibility and improve predictive value of preclinical studies. These are excellent guidelines to follow in preclinical gene therapy studies. However, they are not tailed specifically for muscle gene therapy. In this chapter, I discuss considerations in the design of a preclinical neuromuscular disease gene therapy study based on our experience in the preclinical development of adeno-associated virus (AAV) micro-dystrophin gene therapy. I also discuss adapting the design of phase III clinical trials to animal studies to improve their reproducibility. This chapter is not intended to be all-inclusive and to cover all possible scenarios. 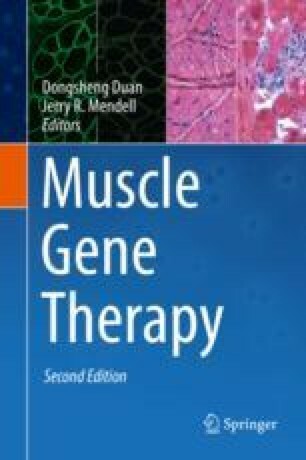 Due to the complexity of the candidate diseases that can be treated by muscle gene therapy, it is critical to consider disease-specific issues in the design of each preclinical muscle gene therapy study. Muscle gene therapy research in the Duan lab is currently supported by the National Institutes of Health (NS-90634, AR-70571, AR-69085), the Department of Defense (MD150133), Jesse’s Journey: The Foundation for Gene and Cell Therapy, Hope for Javier, Jackson Freel DMD Research Fund, Parent Project Muscular Dystrophy, and Solid Biosciences. The author thanks the Duan lab members for helpful discussion. The author thanks Drs. Jianguo (Tony) Sun and Gang (Gary) Yao for their helpful advices on the statistics section (Sect. 17.3.5). The author thanks Emily Million and John D’Alessandro for the help with proofreading the manuscript. The author is a member of the scientific advisory board for Solid Biosciences and an equity holder of Solid Biosciences. The Duan lab has received research support from Solid Biosciences.